GeoViet Consulting is an inter-disciplinary consulting company providing services in research, consultancy and training in the areas of geospatial information technology, urban / regional development, environmental studies and natural resources planning and management as well as in management support of projects / programmes and business analytics for sustainable development. Dedicated to quality research, consultancy and training, GeoViet Consulting commits to provide effective solutions and practical tools for governments, private sector and communities to identify and address critical environmental and development problems and establish rational views for decision making. GeoViet’s mission is to work on Spatial Vision and Gaps Bridging for sustainable development. GeoViet promotes Spatial Vision through integrated geographical / spatial analysis in defining, developing and implementing development policies / plans, and in doing business. We are aiming at filling the gaps, either institutional, economical, social, cultural and spatial through interdisciplinary approach, knowledge generation, capacity building and information dissemination. Ensuring that spatial dimension (geospatial information) is taken into consideration. GeoViet is committed to bringing geospatial and information technologies to the wider community, whether your organization is an experienced GIS user or just about to start out. In all fields of our operation, our goal is to provide cost-effective, open, interoperable and scaleable tools that enable customers to easily and effectively acquire, validate and analyze data as well as generate and present value-added information. Our highly skilled experts aim to provide professional advices and recommend the most viable solutions in a cost-effective and practical manner appropriate to client's circumstances. 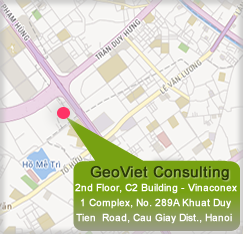 GeoViet’s ultimate goal is to be the leading provider of integrated and intelligent natural resources, environmental, land and value-added spatial information and solutions that are timely, accurate and complete, to be delivered how, when and where customers require them. © 2006-2019 GeoViet Consulting. All rights reserved.